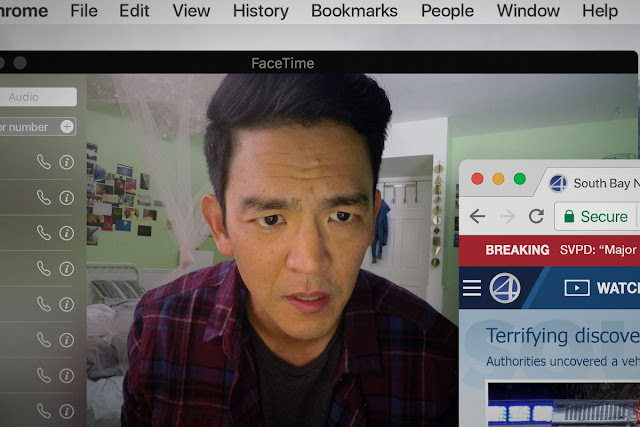 Searching Review | Can Screens Truly Be Cinematic? Last night I had the pleasure of seeing Aneesh Chaganty's first feature length movie, Searching. John Cho played the lead role of David Kim, a father whose daughter goes missing. The film essentially follows David as he hacks into her social medias to see if he can discover what happened to her. The most unique aspect of this film is the fact it is told entirely through a computer. All cameras come from FaceTime, security cameras, video clips on websites etc which I believe to be a very bold way to tell us someone's story. I haven't seen Unfriended but I have heard it is done the same way, if you want something to compare it to. Greta Gerwig mentioned whilst doing press junkets for Lady Bird that a small factor of her setting her film in the early 2000s is that she didn't know how to make screens cinematic and I agree with her, there is a way in which screens aren't great to look at in cinema but they are a big part of the ever-changing technological society in which we live. I believe Aneesh Chaganty and directors alike have cracked the code on how screens can be incorporated into cinema without entirely disrespecting the form. I honestly thought after the intro just before the title card came up that it would get boring and there wouldn't be a way for my interest to be maintained if I was going to be looking at text conversations for an hour and 40 minutes, but honestly it was just done so well that I almost felt bad for enjoying the film. We all know how much of our private and intimate moments can be found on our technology and so getting to see parts of Margot's social media, particularly as the accounts were private until her father hacked into them, felt wrong but it was pretty much the only way the story could be told successfully. I have a slight quibble with the organisation of Margot's desktop, however, because I also am very organised on my computer but my folders still have some kind of mess to them, but that is a small detail! I really love films for characters so that felt like this film's only slight downfall and perhaps the development was enough for people but I couldn't help but be aware that the moments of phone calls or CCTV footage or FaceTimes were scripted. I felt myself not necessarily rooting for the father but more being caught up in the way he was going about searching for her. Perhaps if the film had been shot in a more generic way it would've allowed for us to be more in the mind of the father but that would take away from the unique brilliance of this film. I am, however, very interested to know how Aneesh Chaganty decided to shoot it with his cinematographer. I want to know if all the video footage was shot on high quality cameras or if it was genuinely off computers and phones because if so, it would've made the set environment very interesting and I wonder how that would've felt for the actors, basically being left to entirely play with manipulated reality. I cannot knock, however, the use of tension. It was created so very well which seems like no mean feat when you only have certain tools to play with. I caught myself multiple times saying things such as "answer the phone" "click on that" "don't do that" and it kept the audience involved. I really liked the use of ending the film twice, thinking the case is resolved and then it comes back to life in a last moment plot twist despite it being somewhat expected as the first person convicted felt very unsatisfactory, however, I imagine the director wanting us to feel this as he probably wanted us to will David to push further into the case despite being told multiple times by the detective that the case was closed. It was honestly chilling. It made me want to be more aware of what information I allow the internet to have on me. It definitely will have a greater cultural impact and was most certainly deserving of its Audience Award at Sundance. Searching is out in UK Cinemas 31st August 2018.